Over 200 activists with JusticeLA—wearing “L.A. 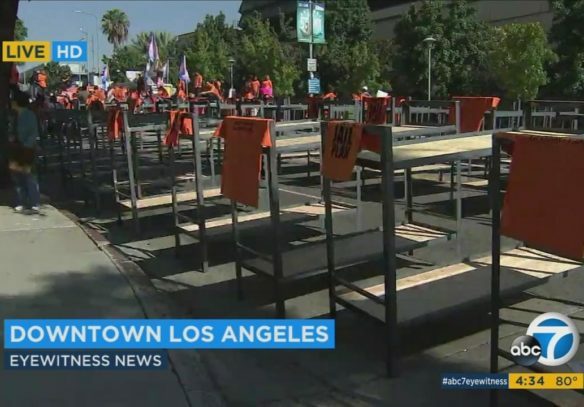 County jail” orange colored shirts—set up 100 jail beds in front of Kenneth Hahn Hall of Administration in downtown Los Angeles Tuesday ahead of the Los Angeles County Board of Supervisors meeting. The beds represented the launch of JusticeLA’s campaign to stop the jail expansion and were intended to send a loud and clear message to the decision makers that JusticeLA opposes spending $3.5 billion on two new jails and supports re-investing that money back into the community. For over 6 hours traffic was diverted around Temple Street between Hill Street and Grand Avenue in the heart of downtown Los Angeles’ civic center area for what JusticeLA says was the largest display of jail beds ever used in a demonstration. 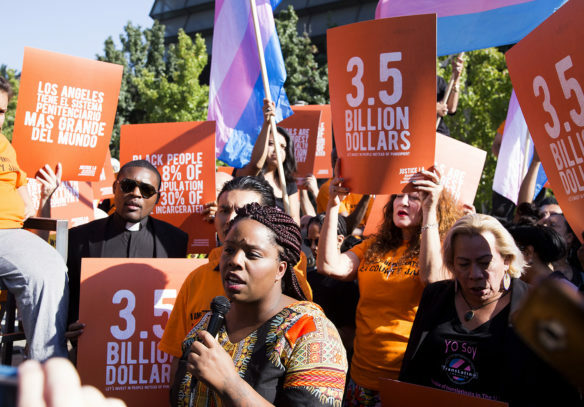 JusticeLA was formed by Patrisse Cullors, co-founder of Black Lives Matter and Dignity and Power Now along with anchor organizations: Californians United for Responsible Budget (CURB), Community Coalition, Dignity and Power Now, Immigrant Youth Coalition, TransLatin@ Coalition, Revolve Impact and Youth Justice Coalition. In partnership with a coalition of community organizations working with directly impacted communities affected by incarceration, JusticeLA was formed to reclaim, reimagine and reinvest what L.A. County could do with the $3.5 billion allocated to building a 3,885-bed replacement for the downtown Men’s Central Jail and to renovate the now-vacant Mira Loma Detention Center into a 1,600-bed women’s facility in Lancaster—replacing the Lynwood facility. Inside of Tuesday’s meeting of the County Board of Supervisors’ meeting JusticeLA presented a motion calling for a moratorium on jail construction and expansion to the supervisors. The motion calls for an independent and thorough review of crime data and root causes, as well as evidence of effective strategies for reducing crime and violence through the reform efforts that are already underway. Supervisors were asked to undertake a thorough study of the potential impact of the recent influx of resources and reforms on the current jail population and conduct an investigation into future reforms that will further reduce the jail and other custody populations. JusticeLA is challenging the supervisors to adopt a framework and methodology for integrating Measure H and Proposition 47 resources to complement existing and emerging efforts by the County of Los Angeles to reduce the jail population, reduce recidivism and increase public safety. Measure H, a quarter-cent sales tax increase approved by county voters in March, is projected to provide nearly $259 million. Proposition 47, passed by voters in 2014, downgraded six drug and theft crimes to misdemeanors and allows defendants to renegotiate their punishments. California will begin the process of awarding millions of dollars in grants funded by the Proposition 47’s cost savings from keeping fewer nonviolent offenders in prison. JusticeLA is also advocating for monies from AB 109, the state’s prison realignment law enacted to ease California’s burgeoning prison overcrowding problem that moves the responsibility of administering certain inmates from the state to counties, to be put into cost-effective programs proven to reduce incarceration and recidivism rather than on expansion of police forces and expensive high-tech tracking systems. In addition, the supervisors are being asked to determine the projected reductions in future jail population based on current County reform efforts – such as the recently created County Office of Diversion and Re-entry, the establishment of a Probation Oversight Commission, and the youth diversion work group – and to create a more accurate assessment of future jail population. Jonathan Perez, of JusticeLA, said time spent incarcerated, even for a short period, can affect a person’s mental health as well as job opportunities. “These beds follow us,” Perez said. Hey Buddy!, I found this information for you: "JusticeLA Kicks Off Campaign to End Jail Expansion in L.A. County". 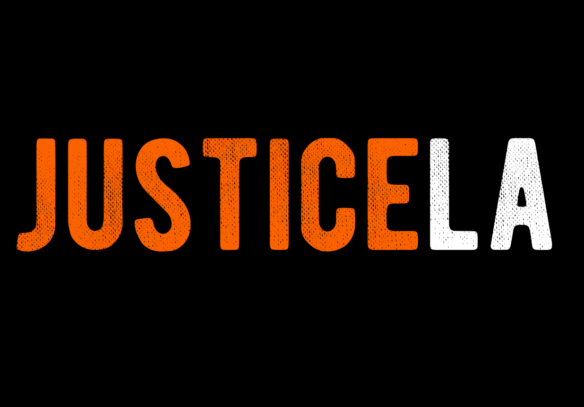 Here is the website link: http://justicelanow.org/justicela-kicks-off-campaign-to-end-jail-expansion-in-l-a-county/. Thank you.